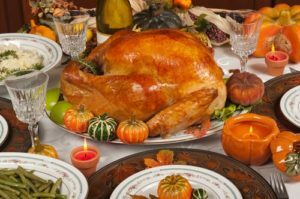 With Thanksgiving right around the corner, you’re probably coming to grips with the fact that you will soon be stuffing yourself silly with turkey, mashed potatoes, pumpkin pie and whatever else comprises your usual, coma-inducing dinner on Turkey Day. But are you aware of just how much you will really be eating? On Thanksgiving Day, you’re likely to eat around 4,500 calories and 229 grams of fat, according to the Calorie Control Council. Where does that number come from? The Calorie Control Council estimates you’ll eat about 3,000 calories during the dinner course itself. Another 1,500 calories in drinks, appetizers and desserts before and after the big feast. Pause for a moment to remember that the suggested daily caloric intake according to the FDA is 2,000 calories. As such, the whopping 4,500 calories the average American enjoys on Thanksgiving Day certainly exceeds that amount. While you don’t want to miss out on any of the tasty food, you probably do want to watch your waistline. Fortunately, you can have your turkey and eat it, too, by focusing on fitness. According to Livestrong.com, a 160-pound adult can burn about 500 calories per hour training in a martial art like MMA. Also known as “The Gentle Way,” Judo is a Japanese martial art with its roots in jiu-jitsu. Students will learn how to both attack and defend using their own body’s leverage to throw opponents as opposed to striking with their hands or feet. This discipline is an excellent form of self-defense. While many martial arts teach offensive techniques, karate places a much larger emphasis on defense and counter-attack. Jiu-jitsu is a traditional Japanese form that teaches self-defense by utilizing an attacker’s own weight against him or her. Brazilian jiu-jitsu, which is popular in MMA, involves more grappling than the traditional Japanese style. It’s a sport that’s more than 2,000 years old and may be rooted in the Muay Thai fighting style of East Asia. Originally, it was practiced for self-defense, but then took on more attacking types of movements and evolved into a popular fighting sport. This martial art bears a lot of similarities to karate in that it is taught primarily as a version of self-defense. The main difference is that taekwondo, which originated in Korea, involves many more kicks.